In an effort to get pictures of wild lions, wildlife photographer Greg du Toit went to some disgusting lengths. 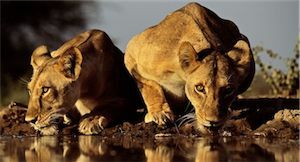 The defiant photographer had endured a year of failed attempts at getting the right picture after building hides and digging trenches near the animals’ drinking spot. In a final desperate effort, the 32-year-old decided to take the plunge and climb into the murky pool with his camera…he sat semi-submerged for 270 hours to get the big cats on film.